127 km and 4,700 spectacular meters of elevation gain among glaciers, countless 4,000-meter peaks and the enchanting mysticism of centuries-old mountain villages – this is the Stoneman Glaciara. Finally: The new Stoneman Glaciara Mountain Bike season starts on 14 June 2019! 4,700 meters altitude gain, 27 billion tons of ice: The Stoneman Glaciara is the new mountain bike experience by Roland Stauder in Switzerland. 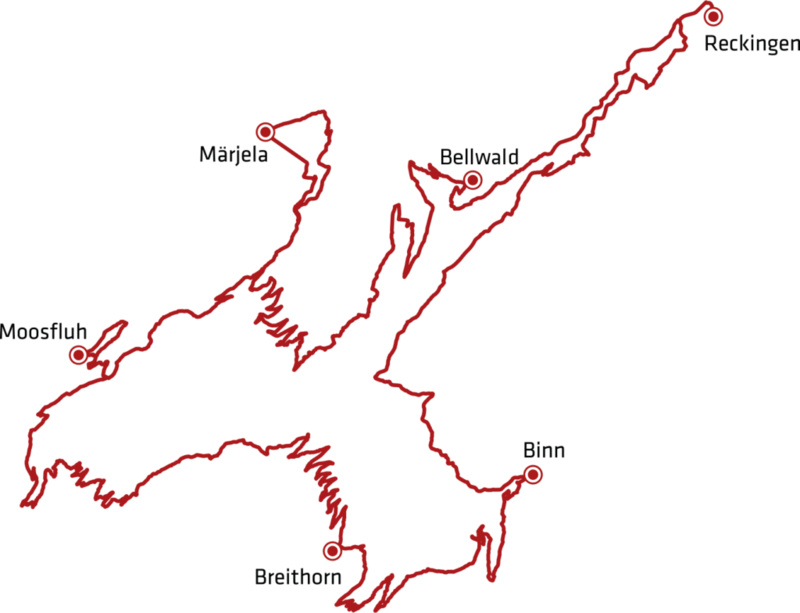 The route comprises three stages leading up to the Great Aletsch Glacier – the mightiest ice stream of Europe – and back to Mörel. The King’s Ascent follows, with almost 1,600 meters of elevation gain: an old military road leads steeply up to Breithorn pass at an altitude of 2,451 m.
Next comes the descent into the Binntal valley. From then on, it follows the Rhone river towards Obergoms – through ancient, mystical villages, past monuments steeped in history and by inviting cafes.